What Is Gout? Toothache For Your Bones! It should be easy to answer. I know exactly how gout works. I know what causes gout, and I know how to control it. More importantly, I know how to help you control gout, but writing a simple description, is difficult. Sure, I can describe all the processes involved, and I do that throughout this website. But explaining biological processes and medical techniques is not very helpful to most people. Before long, you are confounded by terms like uric acid, urate, inflammatory response, colchicine, synovial fluid analysis, prophylaxis, allopurinol, crystal induced arthritis, and many more. These are all relevant, but do they give you a simple gout definition? You know the pain of gout, but just saying: gout is a pain, does not help. There are many other type of pain. We speak of headache, or toothache. 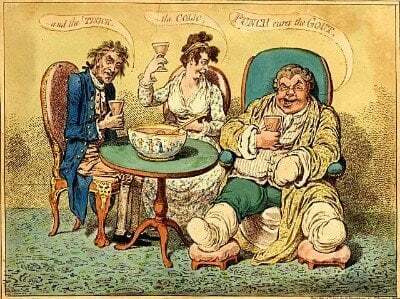 Gout is often described as footache (the old term is podagra, but that means footache). Faced with something familiar, like pain, in an unfamiliar setting, like gout, I find it useful to compare gout with something you understand. Though they hurt for very different reasons, gout and toothache have many similarities. Let’s see how they compare. What Is Gout Compared To Toothache? Pain level Discomfort to unbearable Discomfort to unbearable Both hurt to the point where we have to stop the pain, and stop it coming back. Pain Control Treat infection and block pain Treat inflammation and block pain Use most appropriate meds as advised by your dentist/doctor/pharmacist. Treatment Apprehension Fear of discomfort and invasive procedure Fear of pills-for-life and side-effects These fears are irrational. Learn to overcome them, or get therapy. Consequences Of Not Treating Pain gets worse, more frequent and spreads to other teeth. Teeth lost. Pain gets worse, more frequent and spreads to other joints and tissues. Lumps grow under skin and may burst through. Joints destroyed and kidneys fail. Lumps grow under the skin, restricting mobility, and they burst through, risking infection. Stones grow in the kidneys reducing kidney function, risking death. The saddest thing in the gout world is seeing someone struggle to walk in their 70s and 80s, when they could have stopped the problem in their 40s or 50s. It is never too soon to lower uric acid to safe levels. Everyday you leave uric acid uncontrolled, is another day of extra risk to your joints, skin, and kidneys. Do not be complacent even if you are taking gout treatments. If uric acid is not at safe levels, your health is at serious risk. Less than 1 in 2 doctors understand this, so today is the day you must take control. Does this explain “What is gout” to you? If you can improve this gout definition, please share your opinions in the gout forum. If it leaves you with more questions, please ask them in the gout forum. Whatever you have to say about What Is Gout, please click the Ask Now button, or start your own gout discussion. Related Gout Facts: What Is Gout?